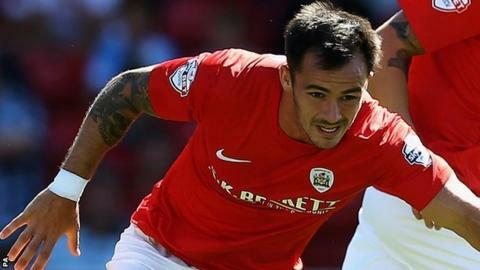 Coventry City have completed the signings of Barnsley striker Chris Dagnall, Yeovil defender Dan Seaborne and Sheffield Wednesday forward Chris Maguire on loan until 5 January. Dagnall, 27, has scored 80 goals in 321 league appearances since starting his career at Tranmere Rovers in 2003. Seaborne, 26, has made 11 appearances for the Glovers this season after signing from Southampton. Scotland international Maguire, 24, has not played for the Owls since August. Seaborne was originally a target for Coventry in the summer and manager Steven Pressley said: "Circumstances and the offer of Championship football meant we couldn't quite get a deal done. Devon-born Danny Seaborne started his career with Exeter City, helping the Grecians win back-to-back promotions from the Conference to League One between 2007 and 2009, before playing for Southampton, Charlton (loan), Bournemouth (loan) and Yeovil. Liverpool-born Chris Dagnall has an overall career tally of 92 goals with Tranmere Rovers, Rochdale, Scunthorpe United, Barnsley and Bradford City (loan). Maguire started his career at Aberdeen and had spells at Kilmarnock, Derby and Portsmouth before joining Sheffield Wednesday in June 2012. "But I'm delighted we've been able to bring a player of his calibre to the club. He has the ability to be a strong and imposing figure in the heart of the back four." Pressley was also pleased to complete Dagnall's move after several days of speculation. "I'm fully aware of his capabilities having spent quite a lot of time watching him in the early part of his career at Rochdale and he made a lasting impression on me," added Pressley. "His work ethic and his eye for goal will certainly give us a boost." On Maguire he added: "He's got a great set piece delivery, he's quick and he can play both out wide or as a striker so he's a player that brings good versatility and that is important within our tight group." All three are expected to figure in Saturday's League One trip to MK Dons, for which the Sky Blues have so far sold almost 7,000 away tickets.